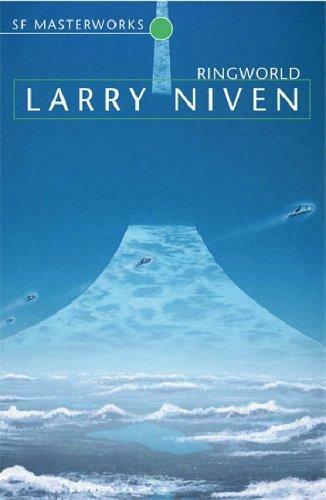 Larry Niven's Ringworld has a mundane plot. A party of adventurers crash on an alien artefact and attempt to escape from it. The plot, however, is to all intents and purposes irrelevant. I am gripped by the conviction that Niven envisaged the artefact in question and simply wanted to come up with a vehicle to describe it over the course of 280 pages or so. The construction in question is a solid band circling a planet, a million miles in radius which has been terraformed by architects whose presence is still felt despite their absence, and which has now fallen into decay. Niven muses over the intricacies of its form and function, from the foundation material to the cloud squares which separate night from day, and constructs a wholly convincing environment in so doing. A few paragraphs of scant description will not do his successes in this regard justice, and I would recommend reading it for these evocations of a vast alien environment alone. Ringworld's habitats remind us of our own, yet are described as being of such a scale as to make the reader feel insignificant even within the pages of the book. On closing it, our own world seems rarer and less familiar, increasing in magnitude as we ourselves diminish, overturning the familiar trope of 'the shrinking world' and letting us once again revel in the scale of nature. 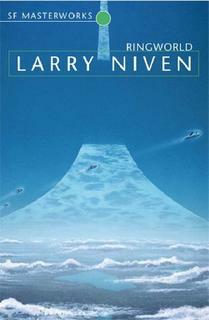 Iain M. Banks' Consider Phlebas reworks the idea of the ringworld to great effect, but Larry Niven got there first. Winner of the 1971 Hugo Award, Ringworld is also noteworthy for some (but not all) of its characters. The four adventurers are (ostensibly) led -- or, more accurately, hired by -- Nessus of the Puppeteers, who resembles a large semi-plucked turkey with two necks, a brace of python heads, and bipolar disorder. Speaker To Animals is an oversized brawny ginger tom cat of the warlike Kzin race, which has battled mankind for centuries and been overthrown as a consequence of the Puppeteers technological intervention on behalf of humanity. As it turns out, the Puppeteers have been manipulating both races for their own ends, a fact which Niven (hilariously) tries to deploy as a plot twist; but the clue is in the name, isn't it? The two humanoids, Louis Wu (chosen for his experience) and Teela Brown (chosen for her supposed luck) are, frankly, tedious, and the exposition regarding their relationship slows the book to down to a crawl in a places. In summary, whilst I could hardly recommend Ringworld for the telling of its story alone, Niven's peerless description of an alien artefact of almost incomprehensible enormousness is what makes this book so satisfying. Take his conjuration of some of that wonder from it and see your own world through it. The SF Masterworks edition's cover is absolutely stunning, too. Note: Ringworld was the eighth entry in the 2001 hardback SF Masterworks series (second cover image above), and the sixtieth entry in the numbered SF Masterworks series (first cover image; 2005). A printing error saw the volume bear the number '72'.